San Diego, California offers many interesting and healthy amenities for business travelers. 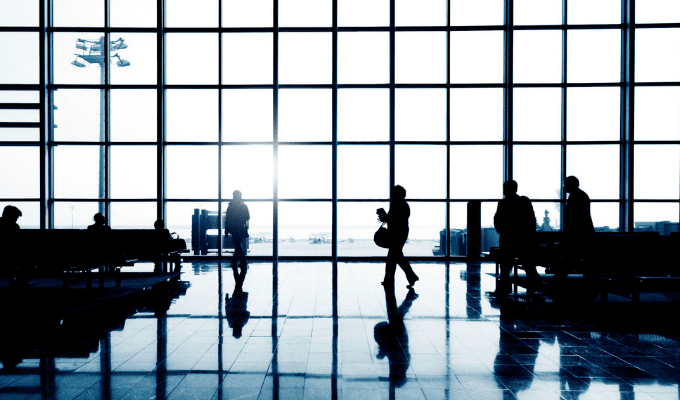 San Diego is an excellent destination for business travelers. San Diego is famously known for its miles of beaches, amazing weather and high military presence, however, there is a lot to be said about the healthy restaurants, hotels, and fitness classes that “America’s Finest City” offers. I explored some of these different places and compiled a list of healthy San Diego travel tips for business travelers heading to this sunny city. One of the nicest hotels to look into while staying in San Diego would be the Manchester Grand Hyatt: San Diego. This waterfront hotel comes complete with views of the gorgeous San Diego Bay. 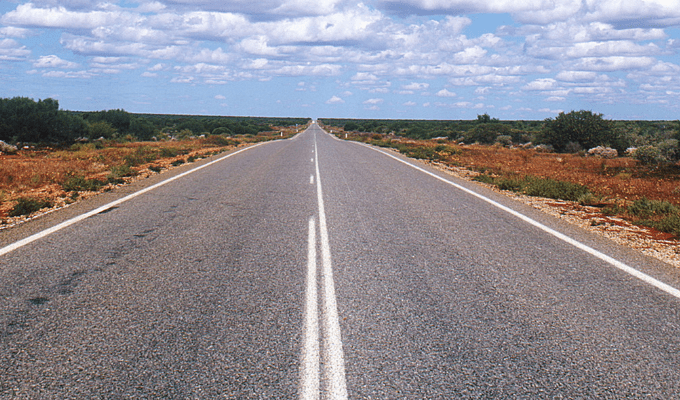 It has a resort like atmosphere with dining, shopping, and entertainment. The hotel offers dining choices ranging from casual to fine dining. And, you can enjoy an amazing view and special drinks on the 40th-floor cocktail lounge. Business travelers will appreciate that each room comes with a work station and free wifi. The hotel also offers a business package which includes: one item of clothing pressed or steamed per room per day, premium Internet access, a breakfast buffet at Seaviewlt, one bottle of water per room daily, complimentary newspaper delivered to room on business days, complimentary shoe shine upon request and local and 1-800 phone calls. The Hyatt also offers quite a few healthy extras. Upon request, the Hyatt will bring dumbbells and yoga mats to your room if you feel more comfortable working out in the privacy of your hotel room. A couple great and fresh places to eat are Market One, a deli style restaurant with sandwiches and salads, or if seafood is more your thing check out Sally’s Fish House! Market One is open 24 hours and offers healthy and delicious items like wraps, fresh fruit and salads. Sally’s is open for both lunch and dinner and also has a tapas hour from 2:30-5:30 every day. Some fantastic choices from their menu include wild salmon, a citrus salad and even a quinoa medley. The beautiful view of the harbor from inside the fitness center. Thanks @grandhyattsd on Instagram for the picture! The Hyatt’s StayFit gym is also open 24 hours a day 7 days a week and has: recumbent bikes, upright bikes, spin bike, cardio interactive bikes, ellipticals, stairmasters, concept 2 rower, chest and shoulder press, seated leg press, lat pull dow, exercise mats, resistance bands and medicine balls and free weights/dumbbells. The hotel also has sport courts and an option to rent tennis racquets, volleyballs and basketballs. The huge gym located in the Grand Hyatt. Thank you @grandhyattsd on Instagram for the picture! The San Diego Marriott Marquis: This ocean front hotel has access to both the Gaslamp Quarter and the San Diego harbor. 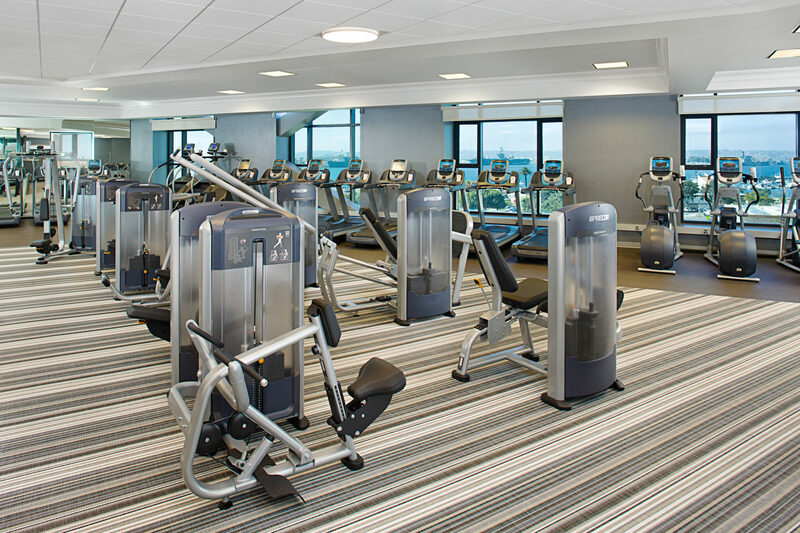 Its spacious fitness center offers both cardio equipment, free weights and complimentary fitness classes. There are two free form outdoor pools and a spa if you prefer swimming workouts. The hotel also offers a biking/jogging trail, kayaking and bike rentals. The Sofia Hotel: This historic 1926 Gothic revival hotel is located next to the San Diego Opera. Its fitness center includes weight and cardio equipment, medicine balls, BOSUs, jump ropes and its own yoga studio where you can take both yoga and pilates classes. The hotel also offers a “Gaslamp Walkabout” every morning at 9 am which is an hour long walking tour of San Diego. 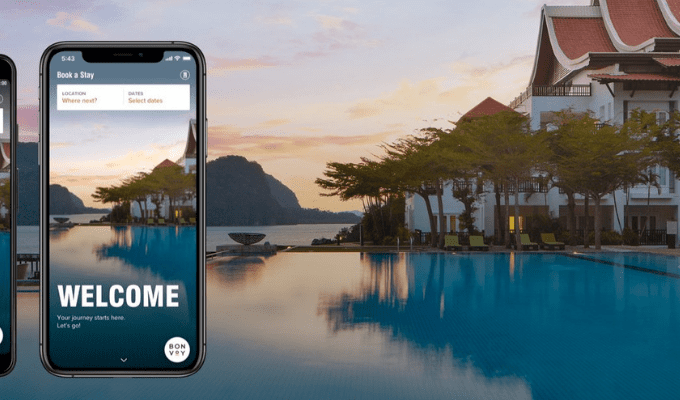 The Hard Rock Hotel: San Diego: This hip and modern San Diego hotel located on Fifth Ave has a gorgeous fitness center that includes both cardio machines and free weights. They also supply complementary Electra Bicycles and have a 24 hour corporate business center. 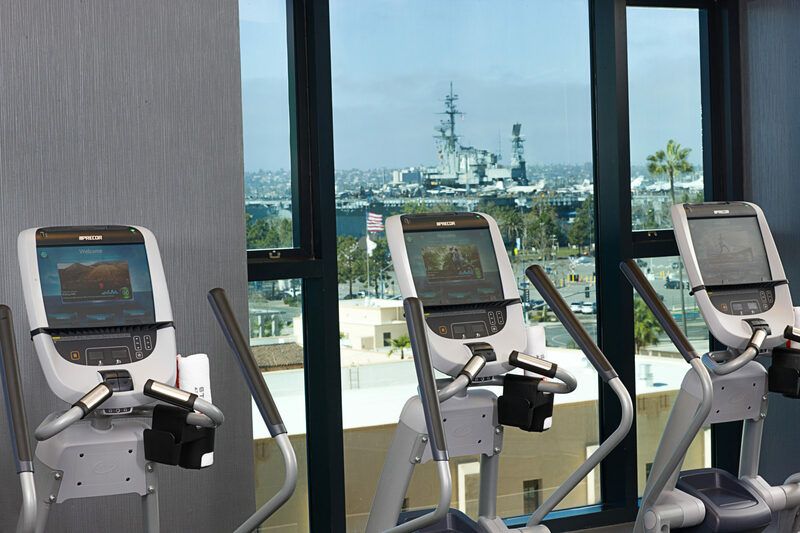 The Omni San Diego: This newly renovated hotel has a 24 hour fitness center with everything you could ever ask for. It includes: a bench press, free weights, leg press, sit up board, cybex equipment, elliptical, stairmasters, bikes, and treadmills with their own personal TVs and headsets. The Omni also has a heated pool with jacuzzi and a spa with various massage therapies such as deep tissue, aromatherapy, reflexology etc. A great place for a nicer business dinner is Seasons 52. 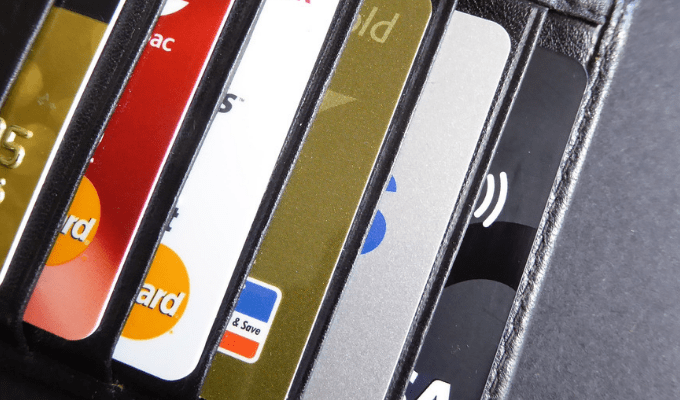 The specific location that I went to was located right next to the San Diego harbor in a small strip mall of mostly restaurants and a couple smaller clothing stores. 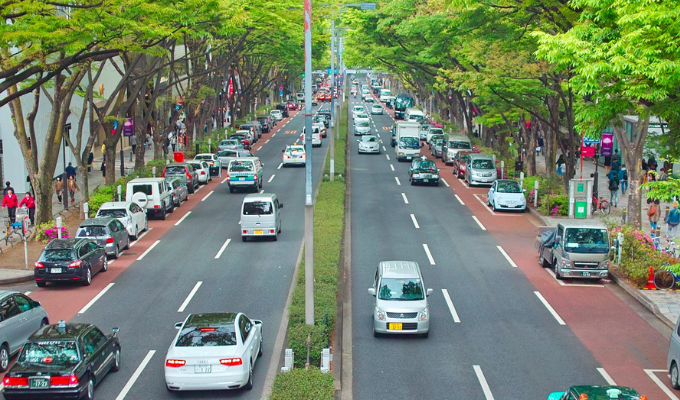 While street parking is available, it may be easier to take advantage of the valet service. Take your ticket into the restaurant to get it validated for a lower rate of $8. The selection of wines available the night I went. 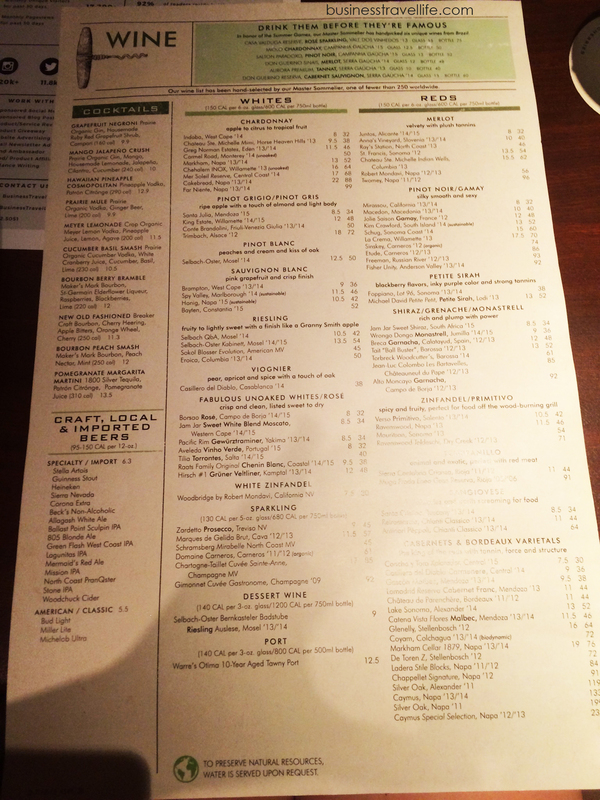 Seasons 52 prides itself on seasonally inspires menus. Meaning that the menu options change based on the fruits and veggies that are seasonably available, which explains the seasons portion of their name. The 52 comes from the 52 rotating kinds of wine that are available based on, you guessed it, what season it is. Since it was summer time when I went there was quite a variety of beets, bell peppers, squash, eggplants and sugar snap peas. We started off with an appetizer of mushrooms stuffed with crab, shrimp and spinach which were piping hot and incredibly flavorful. 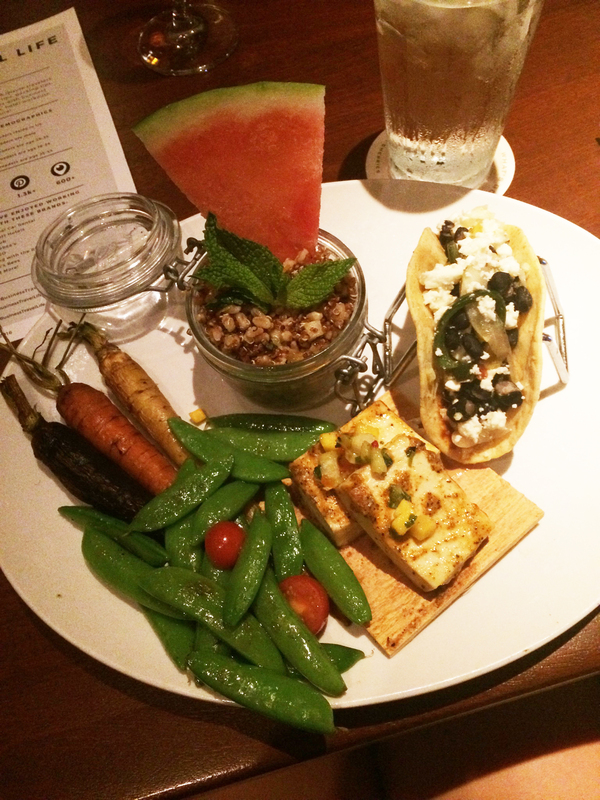 The summer vegetarian sampler platter which came with sugar snap peas, carrots, tofu, quinoa, and a black bean and feta taco. 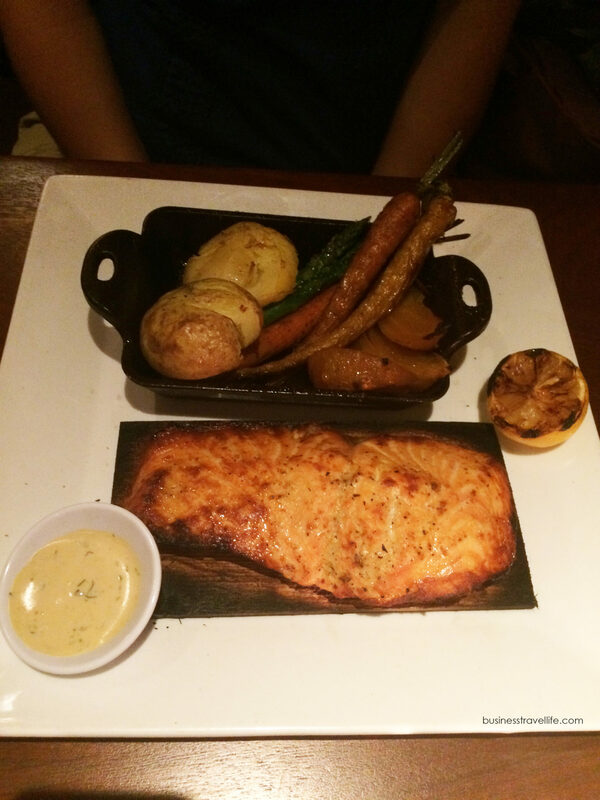 A healthy seafood option on the menu is the salmon, which comes with potatoes and a carrot/beet medley. Another seasonal offering is the lamb. For dessert, expect to see a tray full of desserts that are served in small shot glasses (or you can order off their dessert menu). If you are looking for a healthier dessert alternative, ask for fresh fruit. Overall, Seasons 52 is a great option for a business dinner in San Diego. The wine list offers many options, at a variety of price points, and the seasonal menu offers fresh dishes that are healthy and delicious. Pokez: This is an amazing (and lesser known) Mexican food spot downtown where you can get both regular and vegetarian Mexican food. They serve a variety of options like tostadas, burritos, tacos, and tortas and you can either get them with chicken or beef or you can make them vegetarian by ordering them with either veggies or tofu. They also have amazing sangria for a really reasonable price. Blue Point: A sophisticated seafood restaurant located in the Gaslamp. This is another one great spot to take clients for a nice dinner. They have delicious items like oysters, ceviche, crab, fish, lobster and even octopus. During happy hour you can even get single oysters and shrimp for $1 and $2 respectively. Vitality Tap: Vitality tap is a small juice bar located inside the Nutrimart on 1st Ave. They specialize in fresh and raw juices like green juice, melon and citrus. They also serve smoothies, health shots (like ginger or dandelion), coffee, kombucha and even acai bowls. Since they’re also located inside Nutrimart they sell protein powder, supplements and vitamins too. 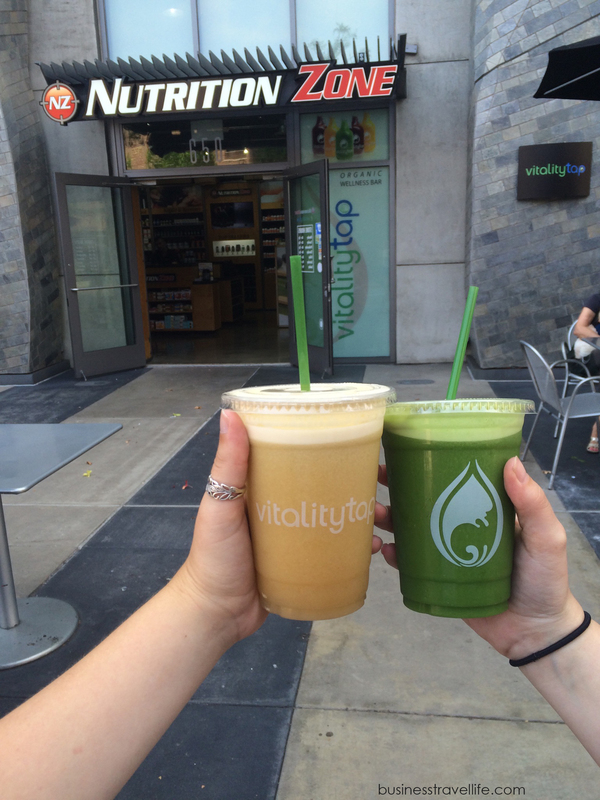 The undressed greens and so citrus juices from Vitality Tap. Since downtown San Diego is such a beautiful location what would be a better way to exercise than renting a bike and exploring the city yourself? The Bike Revolution is the perfect place to do just that. Every one of their rentals comes complete with a bike already sized, a helmet, a bike lock and a repair kit. 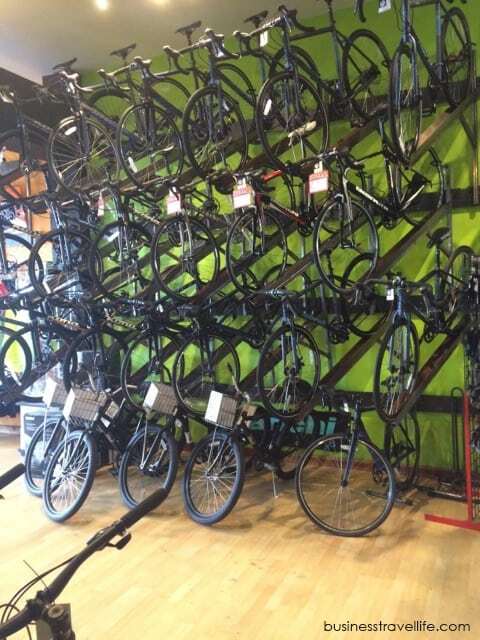 You can rent a couple of different kinds of bikes from them as well. The commuter bike comes in hybrid, performance hybrid and beach cruiser. You can rent bikes by hour or up to a week. The weekly pricing for each runs at about $70. They also offer a couple of different kinds of mountain bikes. A small selection of the bikes they offer at The Bike Revolution. The Bike Revolution will deliver your bike to you free of charge if you’re staying in the Gaslamp and a small charge if you’re staying somewhere else downtown. Yoga One: A yoga studio that offers a wide variety of different types and levels of yoga from classic to vinyasa to even sunrise, this is the place to go if you’re looking to participate in a yoga class. Single classes cost $18 to attend and drop ins are welcome. 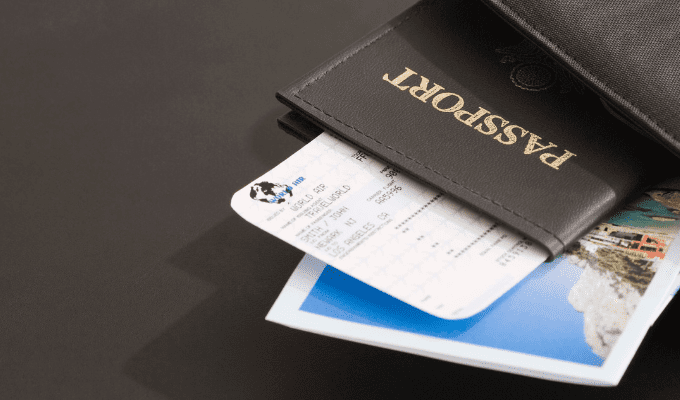 You can also buy a four class package for $44 if you want to save some money. Yoga One also offers massage and acupuncture. Core40: This is a full body workout that you don’t want to miss out on. These classes combine pilates, weight training, yoga and cardio so you can burn anywhere from 500-800 calories per class. They also offer cycle and ramp variations to their intense sessions. One session runs at $35 but you can choose the bigger packages that save you more money like the 5 classes for $125. Wired Fitness: If outdoor fitness is more of your thing you can try these small group workouts of 5-15 people. These traveling hour long fitness classes meet in various outdoor locations like Mission Bay Park, Caramel Valley/Del Mar and Solana Ranch Park. Drop-ins are welcome at these boot camp style fitness classes for $20 during the week and $15 on the weekend. Have you ever visited San Diego? Where did you stay? Did you do anything fun and healthy? 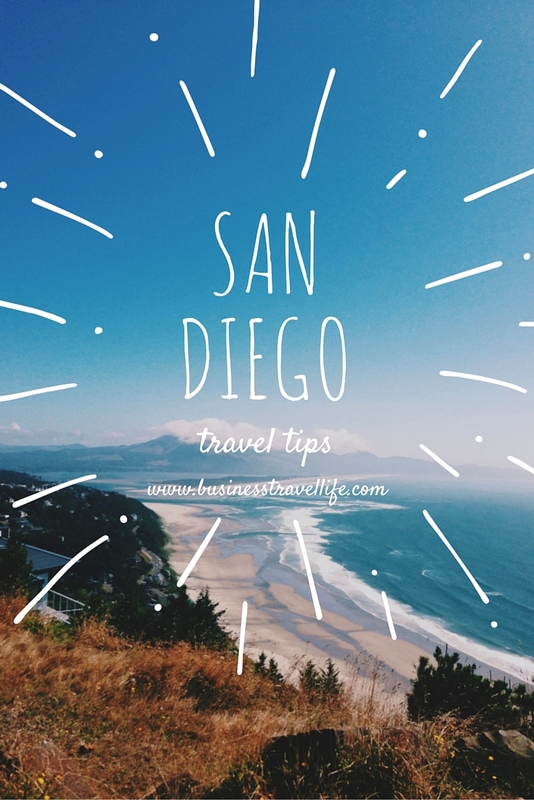 Please share your San Diego travel tips below!